CHRIS ASHER (JNR), the 67-year-old former chief of Osoroase in the Eastern Region and younger brother of Chris Asher (Snr), Publisher of the Original PALAVER, is in deep trouble. Enquiries by the Gye Nyame Concord has revealed that Asher, billed to testify before the National Reconciliation Commission (NRC) this Wednesday, could be arrested if efforts by the Legal Aid Committee to serve an extradition 'warrant' on him were to be successful. The worst nightmare, however, is the latest revelation by a retired circuit court judge who sat on the trial proceedings of Asher that indicts the 67-year-old former Osoroase chief. The testimony of the retired judge reveals that Asher has been lying all along on the issue of the murder of the late Ebenezer Ofori Atta, also known as Ofori Katipie in the early 80s. Despite claims by Asher that no murder charges were formally levelled against him during the alleged period of the murder and that he was never charged for the offence, Mr. Emmanuel Ashalley Ashley, the former circuit court judge, has revealed that Asher was indeed charged with the offence. A woman believed to be his sister whom he was alleged to have given the murder weapon to, was also charged for abetment of crime. Chris Asher appeared in court over the issue, noted the trial judge, Mr Ashley, in a three-page affidavit attached to the writ seeking the extradition of the 67-year-old UK-based Ghanaian-born Asher over the issue. “That the fact before me show showed that the Police vigorously interrogated this woman to show how [and] where the gun had been kept. Finally, she led the police to a pit latrine into where she had dumped the gun. The Police retrieved this gun and showed it to me in open court and in [the] view of a host of persons who were in court to listen to proceedings”, Mr Ashley indicated. The writ was filed by the Legal Aid Committee last week on behalf of the Republic of Ghana and Ms. Matilda Ofori, daughter of the man reportedly murdered by Chris Asher, against the Attorney General for failing to perform his statutory duties regarding the trial of Asher over that issue. Providing the most damning evidence to-date on the murder case against the man described by Ghana's longest serving security capo Captain Kojo Tsikata as an international con artist, the former judge provided a deep narration of events at the time. He said he knew both Asher and the late Ofori well because they regularly attended his court. Whilst Asher appeared as a lawyer with other colleagues on the bar before him at the Akim Oda District Magistrate Court, the late Ofori Atta equally appeared before him in a civil case. The retired judge said Asher was charged together with his sister for murder and abetment of crime respectively. Asher is on record to have misled the NRC into believing that he had evidential recordings and a handwritten testimony to give to the NRC on the murder of the three High Court judges and a military officer from L/Cpl. 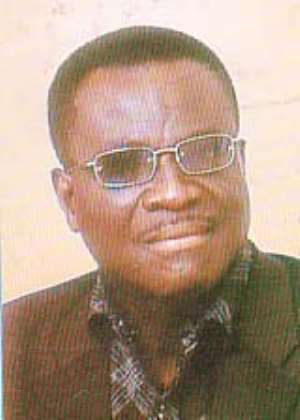 Samuel Amedeka, which implicates former President Rawlings and Capt. Tsikata only to get a safe passage to the country. Eventually when he appeared before the NRC, he never presented the materials he claimed he got during his days in prison to the NRC. He rather claimed they got lost during his escape from Ghana. He is expected to testify before the NRC Wednesday following his recall to be cross-examined by Captain Kojo Tsikata (Rtd), the man who labelled him an international conman. It is not exactly known whether he would turn up, but sources close to the NRC say his return to the country this time is expected to be extremely limited (more details on this Thursday).